It looks like a big Winter storm will be heading to Long Island Monday night into Tuesday. 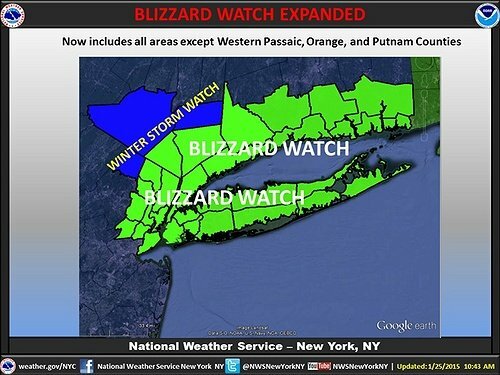 After having an extremely mild Winter for the entirety the Island has experienced so far, the National Weather Service has announced a blizzard watch for Long Island and Southern Connecticut. This potentially historic Winter storm is predicted to hit Long Island hardest Monday afternoon through Tuesday night. Right now accumulations are expected to reach 1 – 2 feet of accumulations. Higher accumulations are possible for local areas. The heaviest snowfall times are forecasted to occur overnight Monday into Tuesday. North winds are expected to reach 25 to 35 MPH with gusts up to 55 MPH and visibility may only be a quarter mile or less at times. This storm will make traveling conditions very dangerous with heavy snowfall, strong winds, and poor visibility likely due to whiteout conditions. Don't forget to check our Long Island School Closures Page for the latest updates on your local district closings. Subject: LongIsland.com - Your Name sent you Article details of "NWS Blizzard Watch: Potentially Historic Winter Storm Juno to Effect Long Island Monday into Tuesday"